This newspaper cutting from the Caribbean Times in 1991 highlighted another interesting black first in the UK. Father Howard James made history by becoming the first British born person of Caribbean decent to be ordained a Roman Catholic priest. I was very interested to highlight a black member of the priesthood. 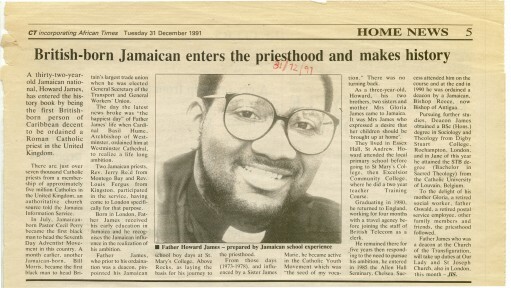 Father James was born in the UK but his parents took him back to live in Jamaica where he received his early education. He later returned to live in the UK and pinpointed his Jamaican school boy days at St Mary’s College in Jamaica, as laying the foundation for his priesthood. Father Howard is still active in the church – see this link.